All of your games get updated every minute to tell you exactly how your plays are doing! Automatic grading, search plays, filter columns, sort plays, and your net units! Add a new play with a click of a button. Main info is already pre-populated! Track all of your balances! Easily see your account number, total bets, invested, net, and more! 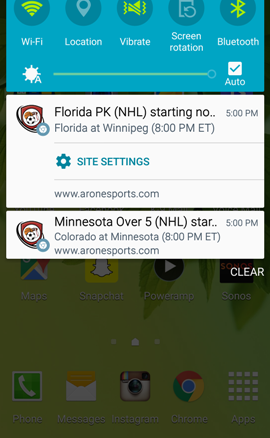 Push notifications directly to your mobile! Arone Sports offers a must need tool for any serious handicapper. We offer a system to track all of your plays while giving live updates on your desktop and mobile devices. AS will facilitate the process of managing the different cappers you follow, books you have money in, and financial transactions that take place! Join today! At this time, it is completely free! Arone Sports was built from the ground up by Robert Arone of Arone Designs. Robert Arone and his brother, Frank, started Arone Sports in 2013 as a professional handicapping service. While this still holds true, AS has revolutionized into a diverse system to track and report sports betting picks. When AS started handicapping sports, they used complex excel spreadsheets to track all of their plays, balances, etc. Eventually, this process got very cumbersome to type every play in by hand and grade everything manually. Robert decided to create this website to allow bettors to easily post picks, get live updates, and have full control of all of their stats. Arone Sports was created to offer a reliable and trustworth pick service. While the owners of AS do their daily duedilligence and stay active in the industry, AS has become a great tool to help handicappers easily track their plays, manage unit sizes, and easily see their current balances of the books that they have invested in.